In our first post we briefly given the history of CPR. In our today’s post we will share with you what is most important and generally speaking first thing to be looked after before we do any help. Your (responders) personal safety is the most important step in first aid scenarios. We have to remember that emergency scenes can be dangerous or there may be associated hazards. We may or may not be in position to highlight all the existing hazards where this incident occurred but we have to be careful to ourselves. We should make sure that emergency scene is safe for ourselves and there are no visible hazards present or developing situations exists, those may harm us. Once you are sure your personal safety is intact, you can anticipate rescuing the victim. Don’t feel shame because this is not ethically wrong. You have every right but first to secure yourself, and then help with a cause to save victims’ life. If the scene is not safe, you should think about yourself. If you failed to think about your safety at first and jumped into the situation, then rescuers may have to recover two victims from scene instead of one. All organizations like American Heart Association (AHA), European Resuscitation Council (ERC), Resuscitation Council UK (RCUK), British Heart Foundation (BHF), Australian Resuscitation Council (ARC), American Red Cross (ARC), Red Cross and others emphasizes the needs of personal safety in their published guidelines. There we also have some supporting stories from all around the world to avoid secondary accidents. One of the American Road Traffic Safety organizations states that 32% of road accidents (in America) are listed in the category where injured were rescuers those rushed to save lives of others but put themselves in dangers. Here we cannot put our head in the sand and have to educate ourselves and made our students more and more conscious during training sessions about the priorities; rescuers safety is first priority. Let me share one example with you where one road side accident (secondary accident) occurred, when an ambulance hit one pedestrian in LACHI; a small town; nearby Kohat city. An incident occurred at remote site area where qualified doctor was deployed, who decided to evacuate the patient to CMH Kohat. On their way to hospital they ambulance hit a pedestrian, an old man, and now the doctor gave him first aid to take him in the same ambulance to CMH Kohat. Just imagine what could have gone wrong which caused driver to adopt unsafe behavior and he hit a pedestrian. In this case, they lost time, they were in anxiety and wasted time on road side with bystanders (who could not understand the whole situation and involved in firefighting with the driver and doctor and started inquiries about the victim in ambulance), how could they have managed the 2nd patient in the ambulance (as generally in Pakistan ambulances can transport only one patient at one time), more stress after the secondary road side accident, medical expenses of second victim, communication expenses, local authorities inquiries, company wide road accident investigation and associated costs. You might recall the hidden cost of accidents iceberg to the above mentioned accident as well. Generally in industry we only consider some of the cases very dangerous, for example; explosives environment, radioactive materials, toxic gases and other hazmats, and only have SOP in place to see if it is safe to enter the scene to rescue instead to have generalize approach. We should also have broader approach to cover all the misunderstandings those can harm you, if you missed your chance at first hand. And now when we have make sure the scene safety, we have to make sure we also have barriers against infectious body fluids and blood. In the end, I just want to finish it that always use your common sense and never approach a scene that is not safe. 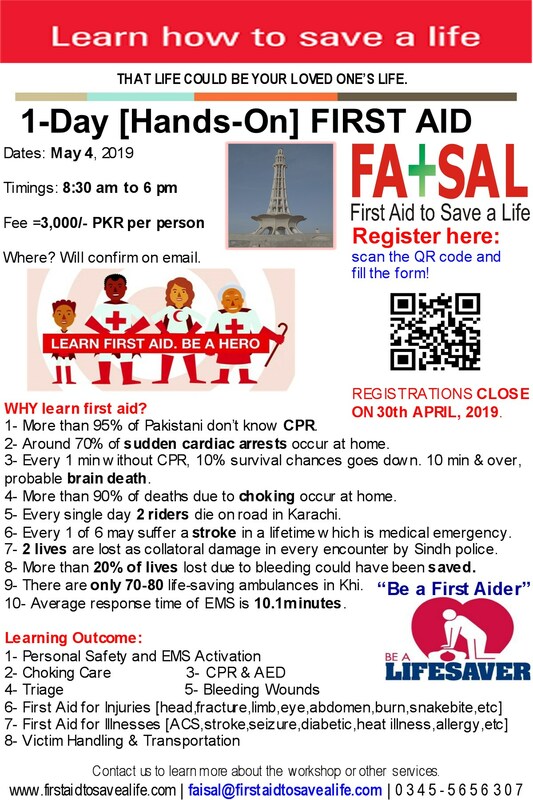 This entry was posted in Advanced First Aid, Basic First Aid, CPR and AED, First Aid, First Aid and CPR, First Aid CPR and AED, First Aid Training Programs and tagged first step in emergency first aid, personal safety, personal safety the top most priority in emergency first aid. Bookmark the permalink.